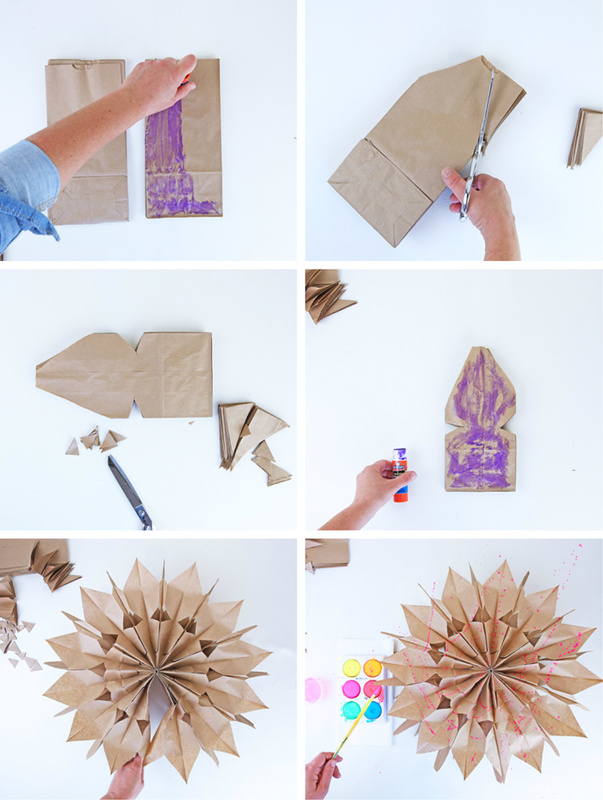 I’ve got a secret for you…wanna know how to make a TON of holiday decorations fast and cheap? 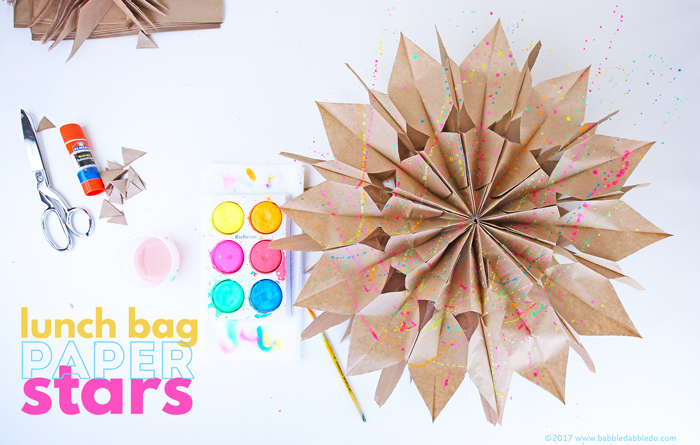 I’m going to show you how to make paper stars out of lunch bags today. 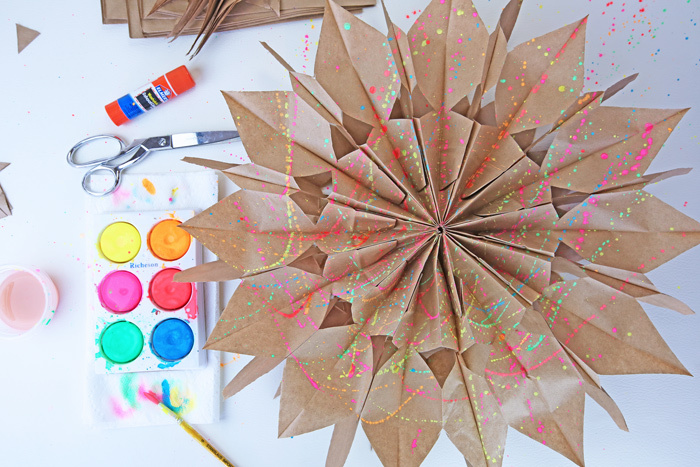 This is a project you can whip up in minutes and make a BIG impact…as in really large! I made a whole slew of these recently for a booth I hosted at our school Winter Festival and everyone asked me how I made them. So as promised here is the how to! 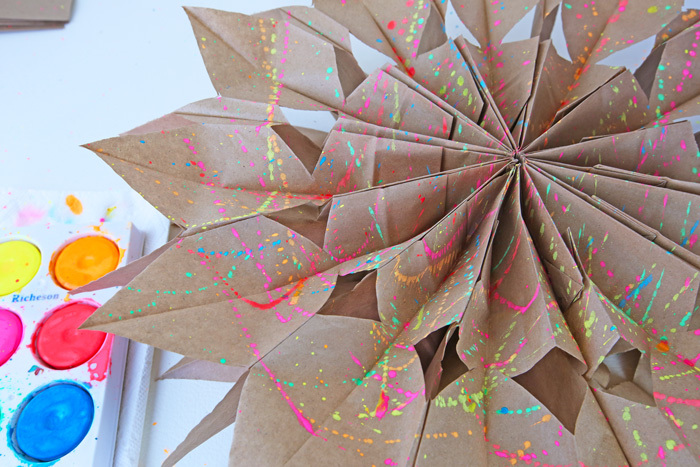 These are a classic holiday paper project; if you want to see the video that inspired everyone to start making these hop over here. 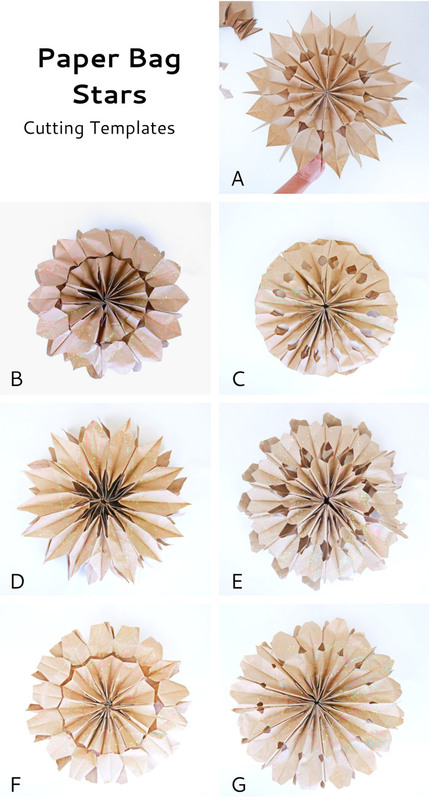 I’ve also got more paper bag stars variations for you at the end of this post so if you like these be sure to check them out! Safety Note: This is a fun family project! 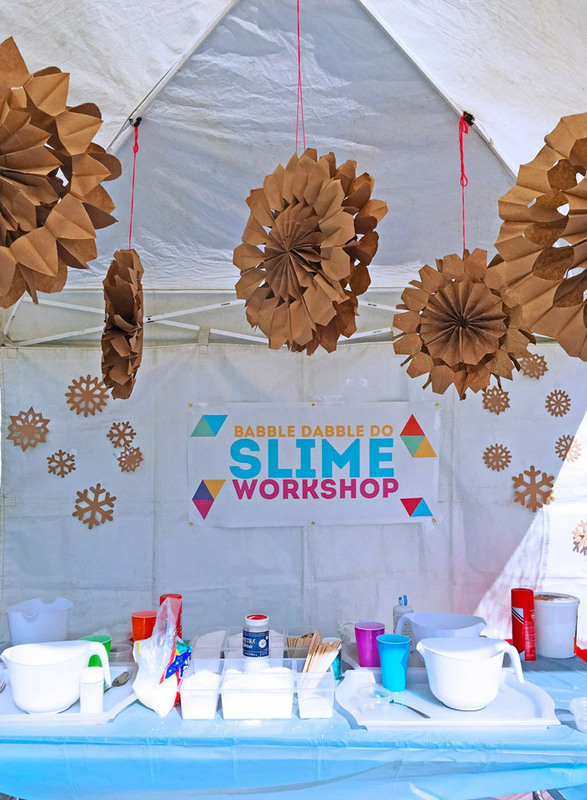 Kids can help with the gluing and decorating. Adults only should handle the cutting. Cutting through a thick stack of bags is difficult and must be done with extreme care. NOTE: Check templates for # of bags per star. The basic star requires 12 bags. Step 2 Add glue to the flat face of the first bag. Place a second bag on top facing the same direction and press down to make sure they stick together. Step 3 Repeat this with all the bags. Step 4 ADULTS ONLY Cut the bags! Cut diagonally along the end of the bag. Add in any center cuts as desired. Test to make sure it can open completely. Step 5 Add glue to the flat face of the top bag. 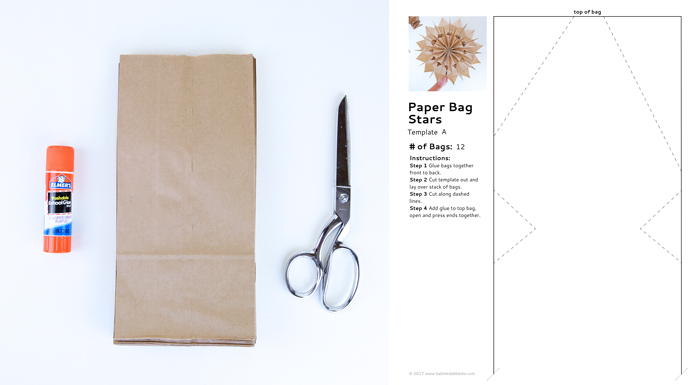 Open up the bag and press it to the other loose end to form a star. Hold until the glue dries. Step 7 Punch a hole in the top of one leaf, cut some string and hang it up! Now make more! You can use our templates to guide you! Match the guide below with the printable templates here. Use the BIG glue sticks! You will need a lot of glue so make sure to stock up on these. 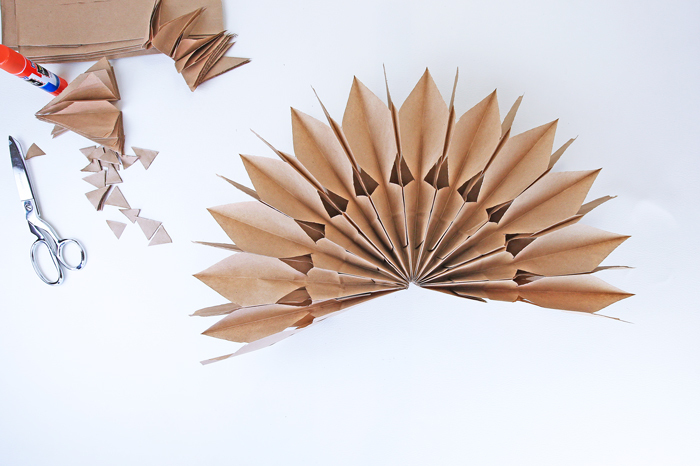 You must cut some diagonals on the ends to have the star open completely. Otherwise you will need to add more bags. If your star does not make a complete circle add more bags as necessary. 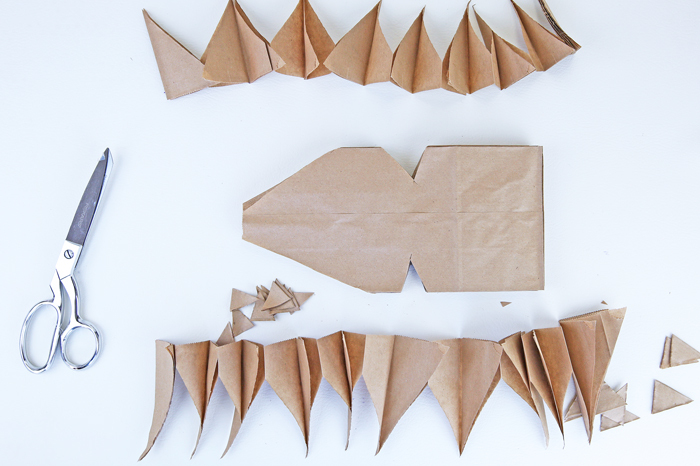 Glue and cut along the patterns you already created. Don’t add too many bags though! If you have a lot of bags your star will get heavy and sag in the center. Make sure the center is glued tightly. The biggest issue with these opening properly is that the center of the star is not glued securely. If necessary add more glue to the center connections. This is best done OUTSIDE or on a large sheet of butcher paper to protect work surfaces. Tempera Cakes We used this set of cake tempera paint cakes for this. They are vibrant but not too thick. Step 1 Dip your brush in water and then on the paint cake to get the paintbrush nice and moist. You’ll have tp do this a few times at the outset to make sure the tempera cake is really wet. Step 2 Flick the paintbrush down towards the star to fling the paint on it. Step 3 Continue dipping and flicking as desired to cover the star with paint. You’re hooked aren’t you? 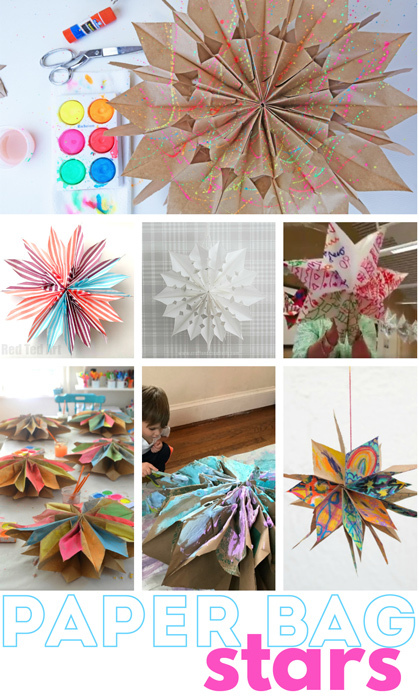 Once you know how to make paper stars out of lunch bags you will be hoarding bags of all kinds to try! Wanna see how awesome they might look? 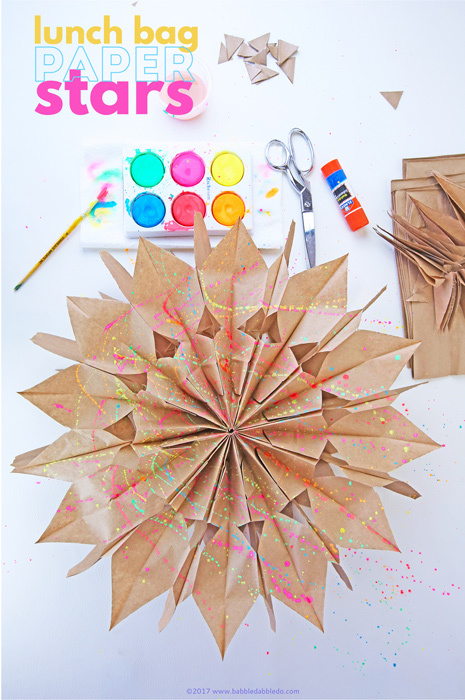 Check out these other paper bag star ideas from other bloggers we love!